Explore Northern Kwa-Zulu Natal, Zululand and Maputuland. Experiences of a lifetime with En Route Travel. 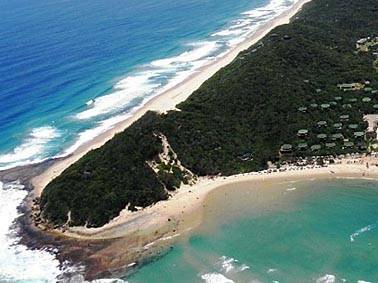 Find Ponta do Ouro accommodation to suit every need! We also do accommodation bookings for Ponta Malongane, Ponta Mamoli and Santa Maria. Browse our website for lots of wonderful Ponta do Ouro Accommodation options: Lodges, Resorts, B&B, Self-catering houses and homes for rent. The quaint little town of Ponta do Ouro is situated in Southern Mozambique just 10 km from the South African border. The hustle & bustle of development, such as houses being restored to their former glory coupled with a good dose of laid back charm are what make this such an unforgettable destination. In Ponta do Ouro you will be sure to find beautiful white beaches, dense dune forests, amazing diving and an ever-stretching azure sea. A very traditional open air market, several "cantinas" (little shops) and eager curio sellers will quench your thirst for shopping before you make your way to one of the rustic restaurants in town.